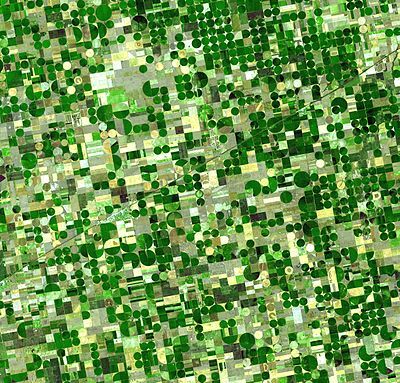 A satellite image of circular fields characteristic of center pivot irrigation, Kansas. Center-pivot irrigation (sometimes called central pivot irrigation), also called water-wheel and circle irrigation, is a method of crop irrigation in which equipment rotates around a pivot and crops are watered with sprinklers. A circular area centered on the pivot is irrigated, often creating a circular pattern in crops when viewed from above (sometimes referred to as crop circles). Most center pivots were initially water-powered, and today most are propelled by electric motors. Center-pivot irrigation was invented in 1940 by farmer Frank Zybach, who lived in Strasburg, Colorado. It was recognized as a method to improve water distribution to fields. Pivot irrigation in progress on a cotton farm. Center pivot irrigation is a form of overhead sprinkler irrigation consisting of several segments of pipe (usually galvanized steel or aluminum) with sprinklers positioned along their length, joined together and supported by trusses, and mounted on wheeled towers. The machine moves in a circular pattern and is fed with water from the pivot point at the center of the circle. For a center pivot to be used, the terrain needs to be reasonably flat; but one major advantage of center pivots over alternative systems that use gravity flow is the ability to function in undulating country. This advantage has resulted in increased irrigated acreage and water use in some areas. The system is in use, for example, in parts of the United States, Australia, New Zealand, Brazil and also in desert areas such as the Sahara and the Middle East. Center pivots are typically less than 1600 feet (500 meters) in length (circle radius) with the most common size being the standard 1/4 mile (400 m) machine. Originally, most center pivots were water-powered. These were replaced by hydraulic systems and electric motor-driven systems. Most systems today are driven by an electric motor mounted at each tower. The outside set of wheels sets the master pace for the rotation (typically once every three days). The inner sets of wheels are mounted at hubs between two segments and use angle sensors to detect when the bend at the joint exceeds a certain threshold. When the angle is too large, the wheels rotate to keep the segments aligned. Most center pivot systems now have drops hanging from a u-shaped pipe called a gooseneck attached at the top of the pipe[clarification needed] with sprinkler heads that are positioned a few feet (at most) above the crop, thus limiting evaporative losses and wind drift. There are many different nozzle configurations available including static plate, moving plate and part circle. Pressure regulators are typically installed upstream of each nozzle to ensure each is operating at the correct design pressure. Drops can also be used with drag hoses or bubblers that deposit the water directly on the ground between crops. This type of system is known as LEPA (Low Energy Precision Application) and is often associated with the construction of small dams along the furrow length (termed furrow diking/dyking). Crops may be planted in straight rows or are sometimes planted in circles to conform to the travel of the irrigation system. A small center pivot system from beginning to end. Irrigation equipment can also be configured to move in a straight line, where it is termed a lateral move, linear move, wheel move or side-roll irrigation system. In these systems the water is supplied by an irrigation channel running the length of the field. The channel is positioned either at one side or in a line through the center. The motor and pump equipment are mounted on a cart by the supply channel. The cart travels with the machine. Farmers might choose lateral-move irrigation to keep existing rectangular fields. This can help them convert from furrow irrigation. Lateral-move irrigation is far less common, relies on more complex guidance systems, and requires additional management compared to center pivot irrigation. Lateral-move irrigation is common in Australia. There, systems are usually between 500 and 1,000 meters long. Center-pivot irrigation uses less water and labor than many other surface irrigation methods, such as furrow irrigation.. It has lower labor costs than ground-irrigation techniques that require digging of channels. Also, center-pivot irrigation can reduce the amount of soil tillage. Therefore, it helps reduce water runoff and soil erosion that can occur with ground irrigation. Less tillage also encourages more organic materials and crop residue to decompose back into the soil. It also reduces soil compaction. In the United States early settlers of the semiarid High Plains were plagued by crop failures due to cycles of drought, culminating in the disastrous Dust Bowl of the 1930s. Only after World War II when center pivot irrigation became available did the land mass of the High Plains aquifer system transform into one of the most agriculturally productive regions in the world. The crops are planted in circles for efficient irrigation. Fossil water is a non-renewable resource. Groundwater levels decrease when the rate of extraction by irrigation exceeds the rate of recharge. By 2013 it was shown that as the water consumption efficiency of center-pivot irrigation improved over the years, farmers planted more intensively, irrigated more land, and grew thirstier crops. In parts of the United States, sixty years of the profitable business of intensive farming using huge center-pivot irrigators has emptied parts of the Ogallala Aquifer (also known as the High Plains Aquifer). One of the world’s largest aquifers, it covers an area of approximately 174,000 mi² (450,000 km²) in portions of the eight states of South Dakota, Nebraska, Wyoming, Colorado, Kansas, Oklahoma, New Mexico, and Texas, beneath the Great Plains in the United States. In the 21st century, recognition of the significance of the High Plains Aquifer has led to increased coverage from regional and international journalists. A May 2013 New York Times article «Wells dry, fertile plains turn to dust» recounts the relentless decline of parts of the High Plains Aquifer System. Writer Emily Woodson characterized the increased use of the center pivot irrigation system as part of a profound attitude shift towards modernism (expensive tractors, center-pivot irrigation, dangerous new pesticides) and away from traditional farming that took place in the mid-1970s and 1980s in the United States. A new generation chose high-risk, high-reward crops such as irrigated corn or peanuts, which require large quantities of ground water, fertilizer and chemicals. The new family farm corporations turned many pastures into new cropland and were more interested in rising land prices than water conservation. Mader, Shelli (May 25, 2010). «Center pivot irrigation revolutionizes agriculture». The Fence Post Magazine. Retrieved June 6, 2012.
ddr.nal.usda.gov Center pivot irrigation system modification to provide variable water application depths. Gray, Ellen (May 3, 2012). «Texas crop circles from space». NASA. Retrieved June 6, 2012. Morgan, Robert (1993). Water and the Land. Cathedral City, CA: Adams Publishing Corp. pp. 35–36. ISBN 0935030026. Alfred, Randy (July 22, 2008). «July 22, 1952: Genuine Crop-Circle Maker Patented». Wired Magazine. Retrieved June 6, 2012. «Growing Rice Where it has Never Grown Before: A Missouri research program may help better feed an increasingly hungry world». College of Agriculture, Food and Natural Resources, University of Missouri. July 3, 2008. Retrieved June 6, 2012. Wines, Michael (19 May 2013). «Wells Dry, Fertile Plains Turn to Dust». New York Times. Evans, R.O. ; et al. (March 1997). «Center Pivot and Linear Move Irrigation System» (PDF). North Carolina Cooperative Extension Service, North Carolina State University. Retrieved June 6, 2012. «Wheelmove Sprinkler Irrigation Operation and Management» (PDF). Darton, N.H. 1898. Preliminary report on the geology and water resources of Nebraska west of the one hundred and third meridian. In: Walcott, C.D. (ed), Nineteenth Annual Report of the United States Geological Survey, 1897-1898, Part IV, pp. 719-785. Dennehy, K.F. (2000). «High Plains regional ground-water study: U.S. Geological Survey Fact Sheet FS-091-00». USGS. Retrieved 2008-05-07. «Shrinking aquifer looms as big problem for farms» Archived 2009-02-04 at the Wayback Machine.. Nancy Cole, Arkansas Democrat-Gazette. September 24, 2006. Last accessed October 24, 2006. Column — Mansel Phillips: «Too many thirsty industries, not nearly enough water». Mansel Phillips, Amarillo Globe News. October 4, 2006. Last accessed October 24, 2006. Morris, John Miller (2003). Sherry L. Smith, ed. The Future of the Southern Plains. Norman, Oklahoma: University of Oklahoma Press. p. 275. ISBN 0806137355.